Cottage in St Vincent Sur Graon, Nr. 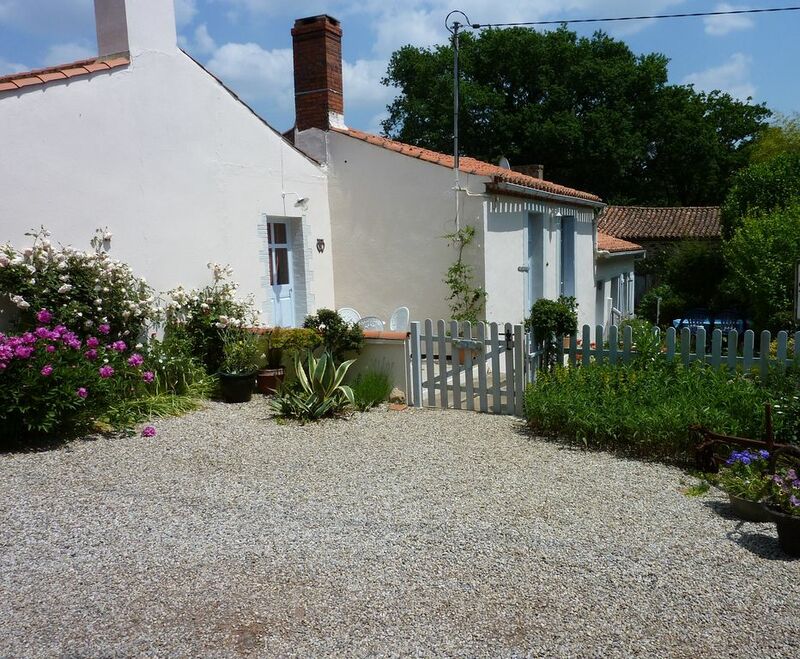 Moutiers les Mauxfaits, Vendee, France - Cottage in Peaceful Countryside, 2 Mins From Lake, 15 Mins Drive from Fabulous Beaches. Situated in a small hamlet, on the edge of the village in the peace of the countryside but only a short drive to the EC blue flag award beaches including la Tranche-sur-mer, a family resort with many bars and restaurants. 30 mins drive to the lively resort of Les Sables d'Olonne, with many bars and restaurants and famous for the Vendee Globe yacht race. 50 mins drive to the famous port of La Rochelle, and the chic island of Ile de Re. In 2018 the Vendee hosts the start of the Tour de France cycle race. 7th & 8th July. The south Vendee is well known by the French for holding onto it's family holiday traditions, and remains very popular with the French for this reason. Perfect for cycling and walking, just 5 mins walk from the lake with fishing, boating and many picnic areas. Chez Marthe is just 5 mins drive from the up and coming local wine growing area, which has recently received an upgrade to AOC - follow the wine route to discover and taste at the many producers. As confirmed Francophiles for many years, we bought our own house for holidays in 1989. We spent all possible time here & decided to make the permanent move in 1998 to make a life-style change. Marthe was our first and best French friend here, a delightful old lady who 'adopted' us and became our French Granny. When she made the decision to move to the retirement home she was delighted for us to buy her house, which is now the holiday cottage, 'Chez Marthe'. Moving to France has allowed us time to expand our creative abilities - Susanne with her embroidery and Nick with his painting, using the treasures found on the beach. In summer we can be found at many markets. Susanne also teaches English to French adults. We wanted a house for holidays near enough to the Channel Ports for a long weekend as well as longer holidays and the Vendee was perfect. Now even better, it's in easy reach of Nantes, la Rochelle and Poitiers airports. We also chose the Vendee for it's fabulous beaches, unspoilt countryside and climate (one of France's micro-climates, mild winters and warm summers). It is called the Cote de lumiere because of it's above average hours of sunshine. The Vendee still has that traditional family holiday feeling, how we used to remember our holidays when we were children. We are in the calm of the countryside, but only 15 minutes from the fabulous beaches, we are able to enjoy the lively resorts but are able to retreat to the calm at the end of the day. Ideally situated for a countryside and/or a beach holiday. As we are very interested in birds and wildlife, it's a fantastic area to see unusual species of birds and animals unseen in England, there are several nature reserves nearby. Lounge area off bedroom with settee and armchairs. UK satellite TV, DVD, CD/Radio. Broadband internet connection (free), DVDs to play, well stocked bookshelf. Kitchen/dining room is well equipped with fridge, large gas hob and oven, microwave, coffee-maker etc. Wood burning stove for cooler evenings out of season. Selection of toys including buckets and spades for the beach. The terraces are fenced and and gates, also a separate grassy area to the side. Several golf courses for all standards, with a 'Golf Formula' which is a pass for all the courses. Nesmy is just 10 minutes away, Bourgenay 15 minutes and les Sables d'Olonne 30 minutes. Three steps down into bathroom and toilet. Toilet and bathroom accessible from exterior. Notes on accommodation: The cottage is called 'Chez Marthe' in respect of it's previous owner, Marthe, who we were very fond of. While it's been modernised we have kept it in the traditional style. There's a wood-burning stove, also convector heaters. Portable ventilating fans. This a 'no smoking' cottage, but you are welcome to smoke outside. Outside: There are 2 patios each with their own table and chairs. These have a fence and gates, also a separate grassy area to the side. Barbecue, sun loungers and reclining chairs. Large parasol. 4 adult bikes. Off road parking. Utility Room: Utility room with 2nd fridge for keeping all your drinks nicely chilled, chest freezer, automatic washing machine, Ironing board and iron. Sink. Sun loungers. Windbreak, parasol, buckets and spades for the beach. Cleaning / Towels / Linen / Maid service: Linen/towels by arrangement. 10€ for double bed and 5€ per single, towels inc. in linen price. Please bring your own beach towels. THERE IS A CLEANING OPTION OF 50 EUROS or you can clean the cottage before you leave - it's to be left as clean and tidy as you found it. If you want to stay in a traditional Vendean cottage, then this is the one. Sue and Nick are very friendly and made us welcome from the start. They are a mine of useful information, especially if like us, your French is not good. The cottage was very clean and the kitchen had all the equipment we needed. We especially enjoyed barbecues and eating outside every night. We really loved Tranche Sur Mer for restaurants and the beach. We loved our holiday in Chez Marthe last summer and are looking forward to returning again this year. The house is decorated in a lovely French style, with lots of artistic flair, we especially liked the well equipped kitchen. We enjoyed eating out in the pretty garden every day and there was space for the children to play. Nick and Susanne are the perfect hosts, helpful, friendly and knowledgeable about the area, where there is lots to do and lovely beaches to visit. We would highly recommend. Very comfortable gite near a quiet, rural village. We enjoyed the perfect holiday in this lovely cottage, which was clean, very comfortable and had absolutely everything we could wish for. The gorgeous weather helped as we ate outside on the patio every day. The pictures don't do it justice really. It is situated just outside a very quiet little village with a boulangerie and a bar. We had a stroll into the village most nights, and the gite does have bicycles too. We enjoyed the lake nearby, and even managed a little fishing. Apparently there are some massive fish to be caught ! The gite is only a short drive from the beautiful Vendee coast and we found some lovely beaches. We had trips to both La Rochelle and Les Sables-d'Olonne, well worth a day out. Sue and Nick, the owners are very helpful, and left us in peace unless we wanted help, and they were so helpful too. We would recommend Chez Marthe, especially if you like peace and quiet in rural France. Would love to go back one day. What a find!! We really enjoyed our stay at Chez Marthe. Quaint and pretty, it lived up to all of our expectations. Sue and Nick are great hosts and are on hand to deal with any query, at all times respecting your privacy. The house is charming,as described and a treat to stay in such a traditional property. It might be traditional but has all the modern conveniences necessary. We enjoyed cooking meals and eating outside on the beautiful, private patio. We made use of the bikes available and took off exploring the French countryside. It was great to have Wi fi and Des was delighted not to miss Wimbeldon on TV. We would highly recommend this property and hope to return in the future. We stayed for one week in Chez Marthe - what a delightful cottage! Chez Marthe is charming and has all the facilities required to make your stay really comfortable. There was nothing we were short of, every little detail has been considered. The garden is private with both sunny and shady areas and is a delight to sit in. The owners, Nick and Sue are fabulous. We had the warmest of welcomes and they are very kind, enthusiastic and approachable if you need help whilst you are there. The cottage is well situated for a great holiday, close to beaches, markets, main towns and many places of interest. It is next to quiet country lanes, great for for cycling or walking. It truly is a place you feel at home in very quickly and we loved it! We arrived late after getting a little lost on the journey, it was our first visit to this part of France. Nick was there to give us a warm welcome and show us around Chez Marth? which we immediately fell in love with. It is such a peaceful area, great for a bike ride with the kids or a morning run to the lake. The cottage is cosy and beautifully decorated in keeping with its history, we had great weather so most of the time was spent on the patio in the garden with a BBQ going. The garden is a fantastic space which the kids loved exploring, playing in and chasing the butterflies! Ours are 6 and 8 and it was a perfect space for them to run around on their own in whilst we relaxed. Just across the road is a football pitch where you could go if you needed a larger space. Nick and Sue are a lovely couple and were always there to help out with suggestions of what to do and which beach to go to, there are so many to choose from with everyone in the family catered for. Their generous hospitality, the laid back nature of the people and the area, the weather and the beaches have made us not hesitate in wanting to return to chez Marth?. For wildlife and bird watching there are many reserves nearby. Superb area for cycling trips with a great network of designated cycle routes. The south Vendee is famous for it's varied choice of beaches, something for everybody - wide, sandy, deserted beaches frequented by surfers, always a quiet spot for private sunbathing. All within 15/20 minutes drive. Safe sandy beaches for bathing surveyed by life guards. Rocky coves and rock pools to explore. Town resorts with all facilities of la Tranche sur mer, (15 mins) Les Sables d'Olonne (30 mins) etc. Although we are near to all amenities a car is essential for the enjoyment of the area. St Malo, is the nearest port, 3 hours by car. Caen 4 hours, Le Havre 5, and Calais 7 hours. The airports of la Rochelle and Nantes are equal distance, 50 mins by car. Poitiers is 90 mins and Rennes 2 hours - all with good car hire facilities. Our village of St. Vincent-sur-graon is 1km (2 mins by car, 10 mins by bike) and has a boulangerie and 2 bars. Moutiers-les-Mauxfaits is 5 mins by car and le Champ-st-Pere 10 mins. The large town of la Roche-sur-Yon with all commerce, many large hypermarkets is 15 mins by car. The resort of les Sables d'Olonne, famous for the Vendee Globe is 30 mins by car. La Tranche-sur-mer, a lively family resort is 20 mins by car. La Rochelle/Ile de Re 50 mins, and the theme park of Puy du Fou 1 hour. Moutiers-les-Mauxfaits is 5 mins by car and has banks, post office, chemist, doctor, dentist, small supermarket, butchers, several boulangeries and a small covered market. Several bars and restaurants. La Tranche-sur-mer is a lively seaside resort with all commerce and a wide choice of bars and restaurants to suit every budget. Les Sables d'Olonne, the famous French resort has something for everybody - a beautiful wide sandy beach, promenade and quayside with many bars and restaurants, fishing port with a fish market, daily covered market, shopping streets, plus the usual supermarkets & shops on the outside of town. La Guittiere just outside Talmont St. Hilaire (one of Richard the Lionheart's castles) is well known for it's oyster production where you can buy direct. L'Aiguillion is famous for it's mussels, also can be bought direct but are on sale everywhere at local markets. Enjoy a bottle of white local wine with your oysters and mussels. The historic town and port of La Rochelle is a must plus the chic island of the Ile de Re where many celebrities have holiday homes. The 'Venice Verte' around Maillezais & Coulon is a maze of small canals where you can hire boats to explore and picnic. The Puy du Fou is another must, having a daytime theme park and an evening 'son et lumiere' which is the most famous in France. Chez Marthe is just 5 mins drive from the up and coming local wine growing area, which has recently received an upgrade to AOC - follow the wine route to discover and taste at the many producers, lovely reds and whites and a superb rose for summer days. Close by are various nature reserves, superb for resident and migratory birds. Booking Notes: To reserve the cottage, we require a cheque or bank transfer for £ 200, which will be held as a security deposit and returned within one week of your departure. The rental price in euros may be paid on arrival to save you transfer charges. Please contact the owners if you would like to discuss the possibily of paying in UK pounds. For further photos and information, and for our personal website, please contact us. The property is to be left as clean and tidy as when you arrive. Any additional cleaning fees will be deducted from the security deposit. We do offer a clean option. This is 50 Euros. Please notify us if you wish to take this up. Changeover Day: Changeover day is usually Saturday, but this is negotiable out of high season. The cottage is available from 16.00 on the day of arrival and is to be vacated by 10.00 on the day of departure. Notes on prices: Prices are for the property per week in euros.